During one of the flights, I took some time to lay out a training plan until my Head Race early October. 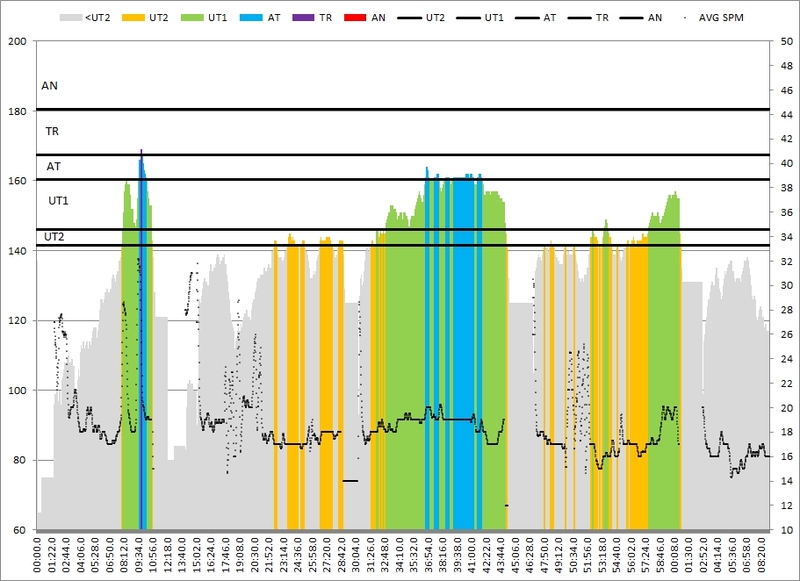 I plan to do a three week mesocycle of threshold training, i.e. spending a lot of time in my hard workouts at 25-29spm. I am actually looking forward to this. 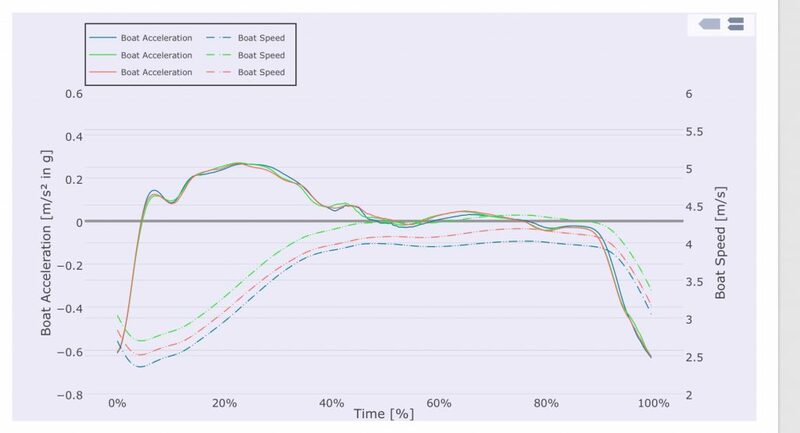 After the sprint racing it is a big change, and it is a range of stroke rate where you can work on technique and boat efficiency a lot. I also want to try out 9 day long microcycles. I have been used to do a weekly plan, but the 9 day cycle allows to balance workouts better. In each microcycle, I want to do two hard distance workouts and one interval workout with short rests. 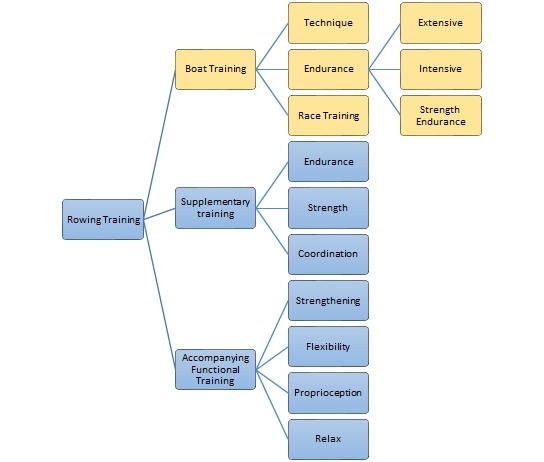 The rst is steady state, cross training and recovery. 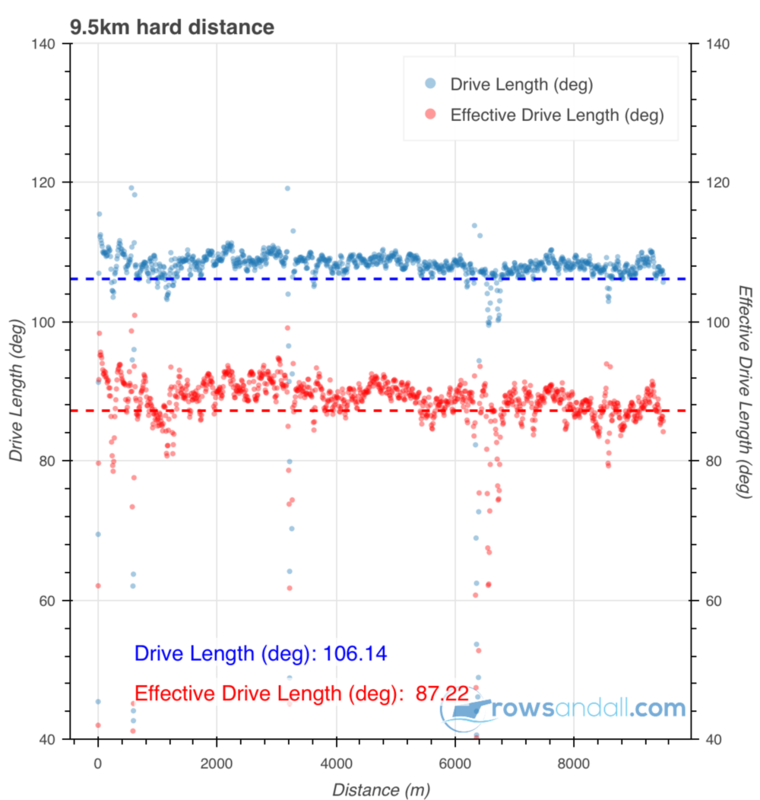 Regarding the hard distances, I plan to start at 10km and work systematically down to 6km. 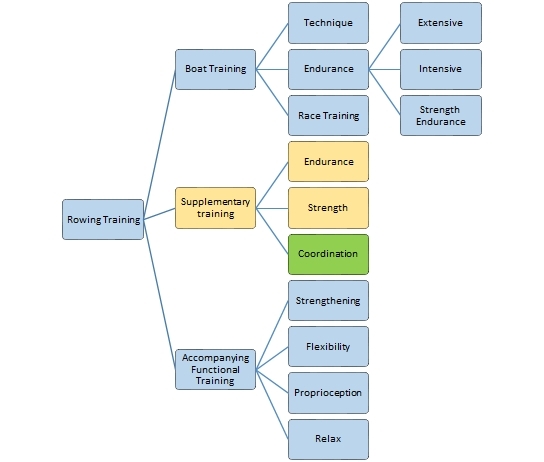 So it starts at the intensive endurance part of the spectrum and ends with threshold rowing. So, at the end of a work week with business travel, I headed towards the lake for my first training after the Masters Worlds. Yay! The task was a 10k but with our lake and traffic pattern, it would be an approximate 10k. 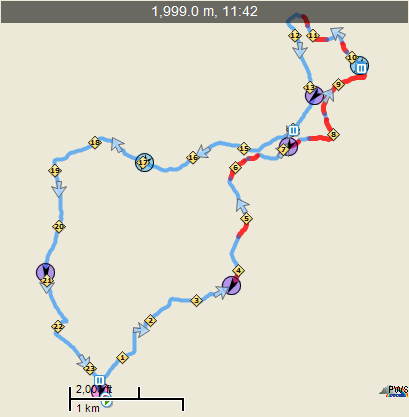 Rokle to Sirka is a little over 3km and Sirka to Rokle is a little less than 3km. In the end I managed to do 9.5km. Yes, it was hard work. My heart rate is high, but I blame that on the travel and not being fully recovered from Bled. 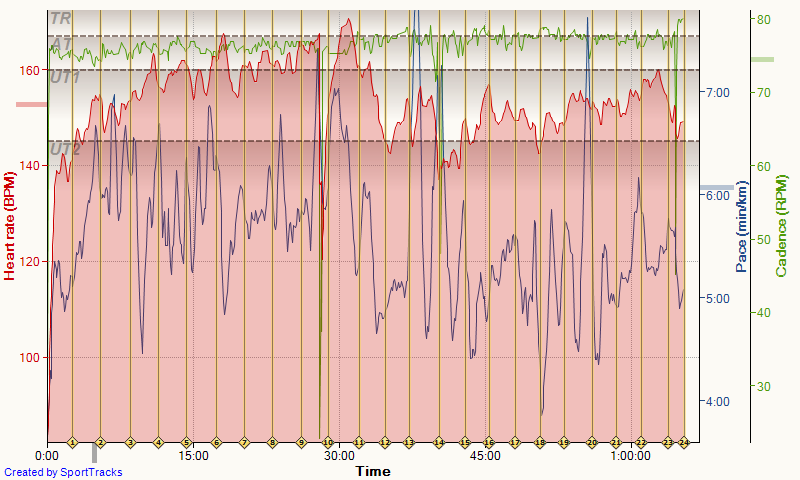 In the first Rokle to Sirka segment, there was a heavier headwind and chop, which you can clearly see from the splits. I aimed at 24spm but didn’t have difficulties going above. Power wise, I was very happy to see me holding a power between 220 and 250 W constantly, and it felt OK. 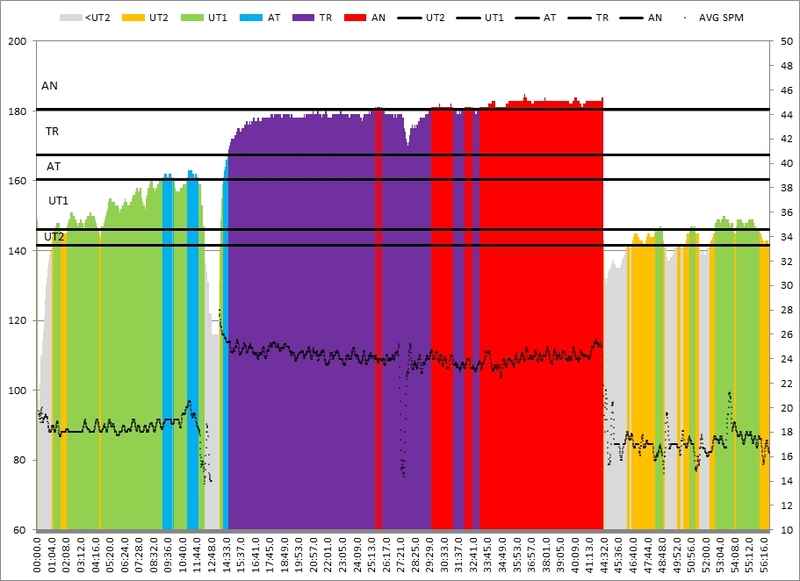 Checking my CP chart, I should be able to hold 225W without difficulty over 45 minutes OTW. My limit is around 250W, but that would be after a good taper. Not after a week with air travel, business dinners after an exhausting regatta. The second part, from Sirka to Rokle, was the best in my mind. This was in mild tailwind. At the end of the first section, the wind suddenly calmed down and after that the lake was very easy to row. I was rowing strong and had a tendency to go up in stroke rate. I had to actively push the stroke rate and power down, knowing that there was another 3k to go. In terms of metrics, I need to decide if I keep using Work per Stroke or switch to stroke length and average force. 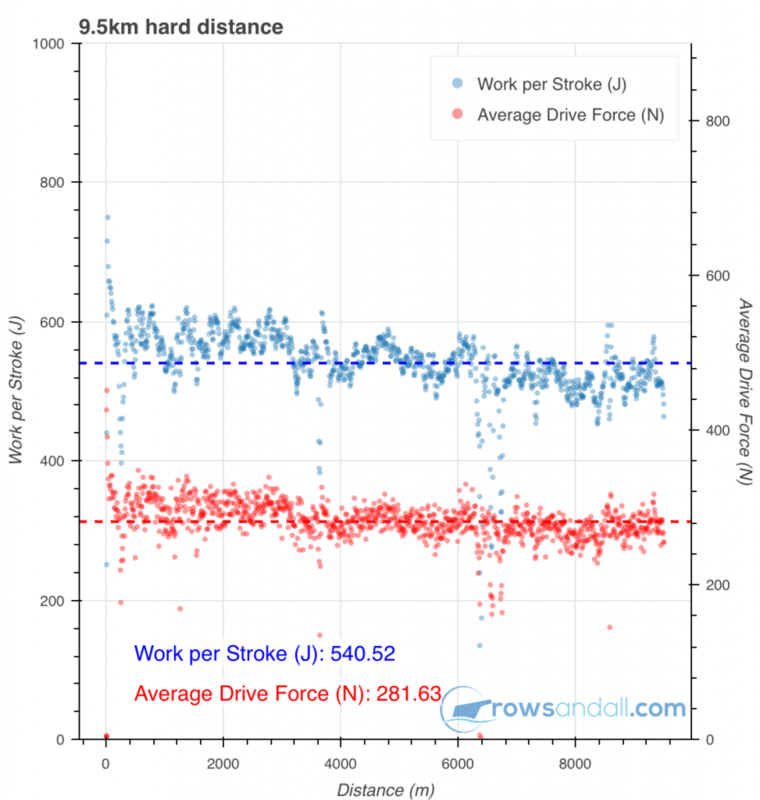 I think I will stick to setting a Work per Stroke target range like I have done so far. 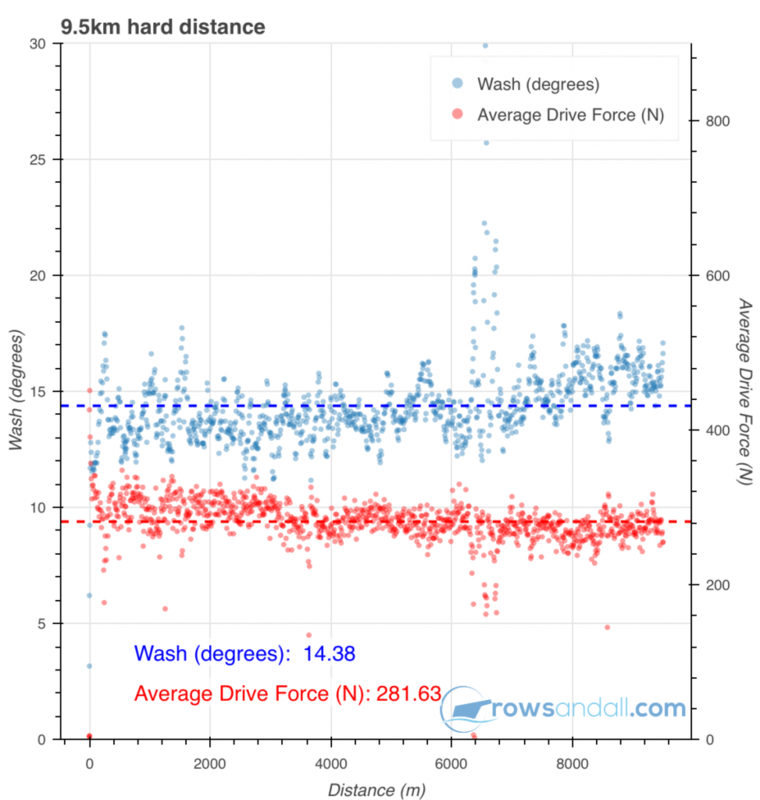 My stroke length doesn’t vary too much, so WpS is essentially determined by average handle force, as is clear also from the charts above. Also, 600 is an easy number to remember, which is important when you do checks while you are working at heart rate above 180. 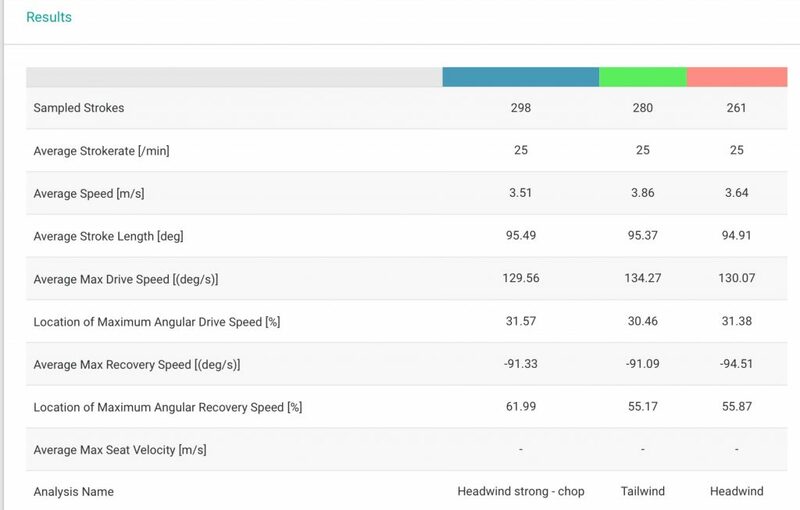 As I had Quiske running, I thought it interesting to average over the three sections. 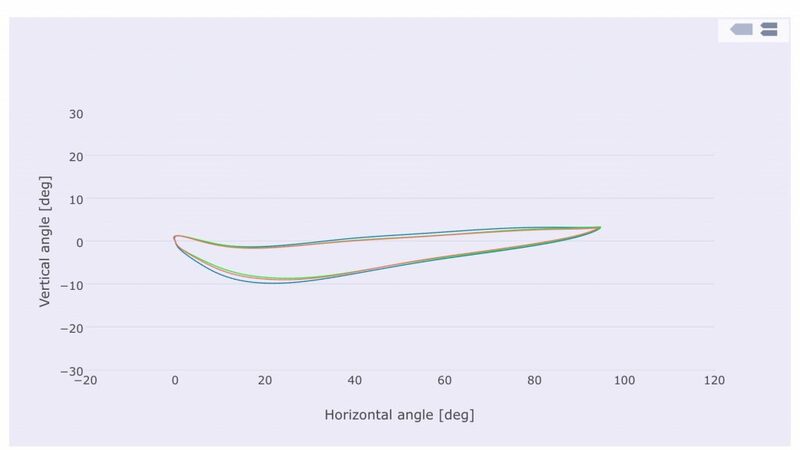 What surprised me most is how close the curves are, where I really had the feeling that the first segment was sloppy and the second one (tailwind) was the best. I tried to go through the recommendation from Olbrecht’s book to plan meso cycles based on my annual plan. Everything beyond January is just penciled in and will need to be refined based on test results and available time. I started by putting the main events (business trips that I am aware of, vacation, and races). The event called “Racice” in week 4 of meso cycle IV of the Preparation phase is a week long stage at the 2k track in Racice that our club plans in preparation for the 6k race in Horin. Then I planned the 6 week cycle IV leading to the 6k race in Horin, copying an example 6 week cycle from the book. Then I added the cycles II and III and tried to think about what type of training. It’s a bit a compromise between the test rows that I want to do and the ideal type of training. 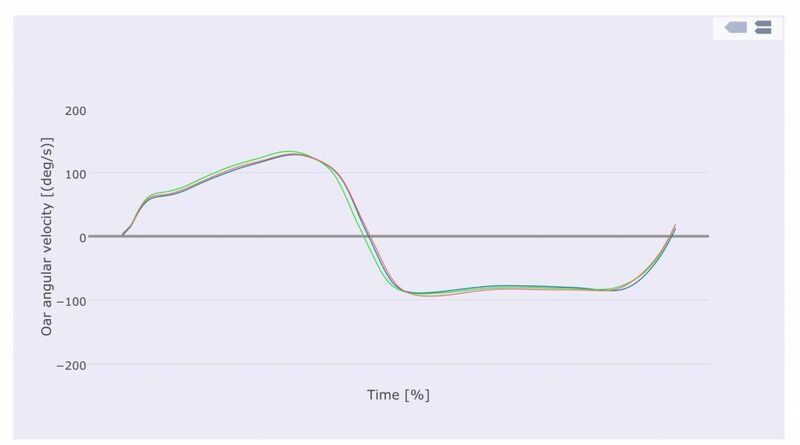 The gray volume bars are just notional now but I am thinking of it in terms of hours per week. 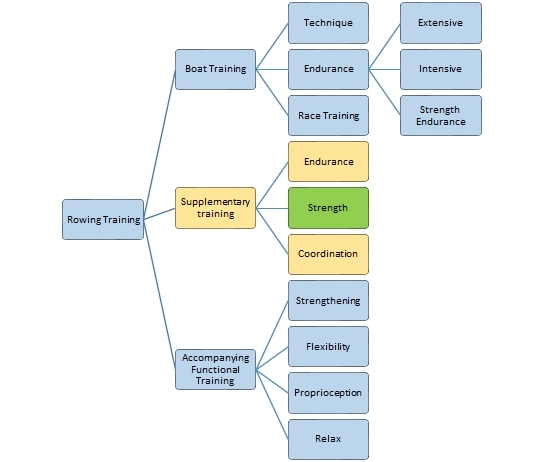 I still have to fill in the little triangles that indicate the intensity and volume of the individual “quality” trainings (i.e. 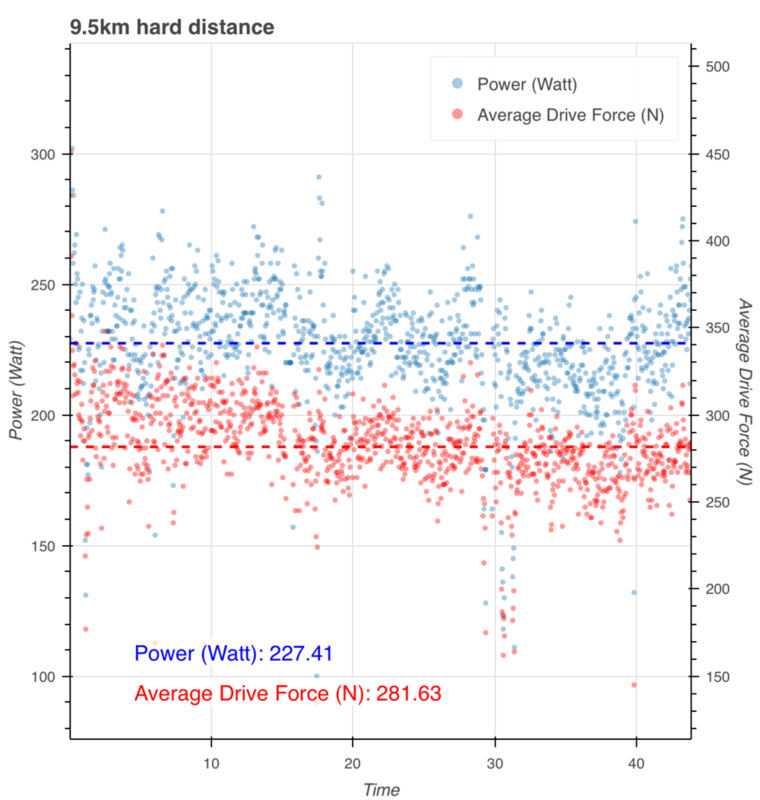 everything else than extensive steady state La<2.0 training). I will do that only the coming meso cycle. Here’s a close-up of the first meso cycle. Final remark. 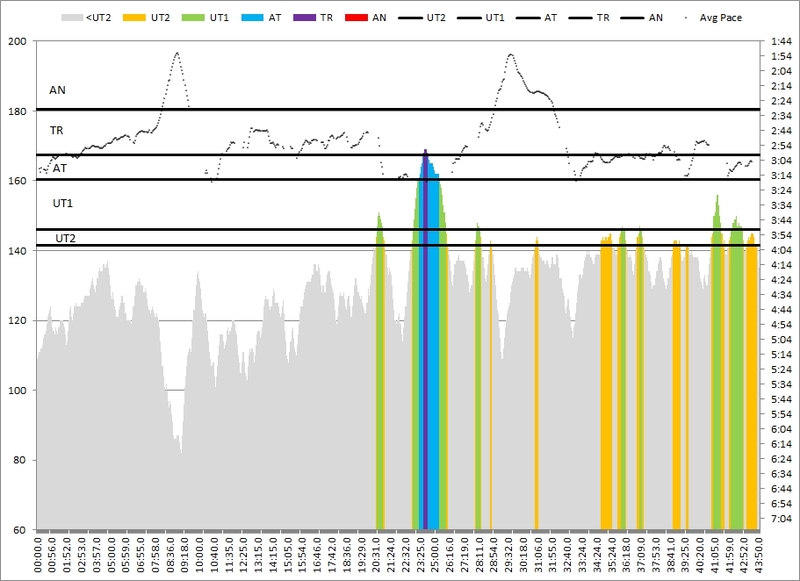 The plan is not different from what I planned as a “typical” training week in this blog post. 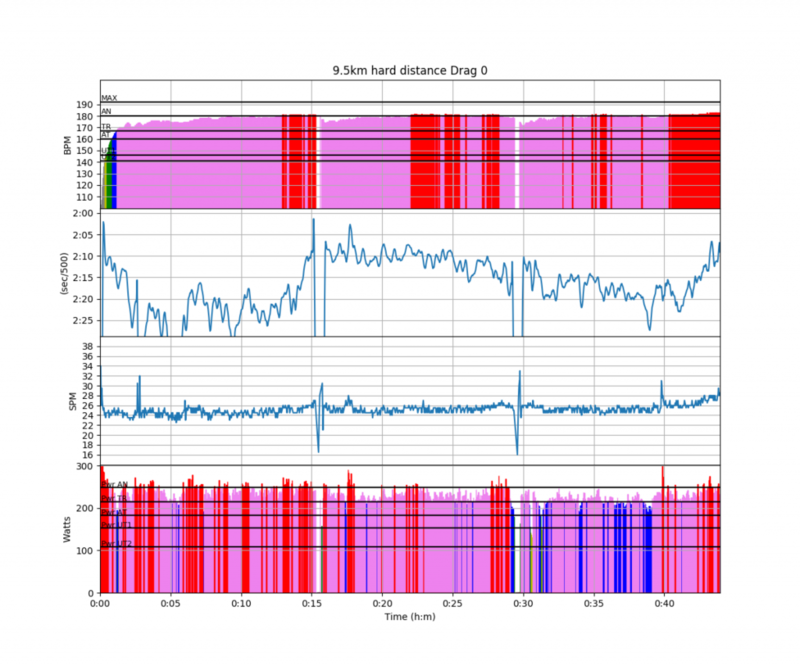 All it does is add some guidance for the total volume and for what type of quality sessions I am planning to do. As said, the overall plan still follows roughly what I have been doing intuitively for the past 2 years, but planning it out like this gives a nice feel for where the pain points are. 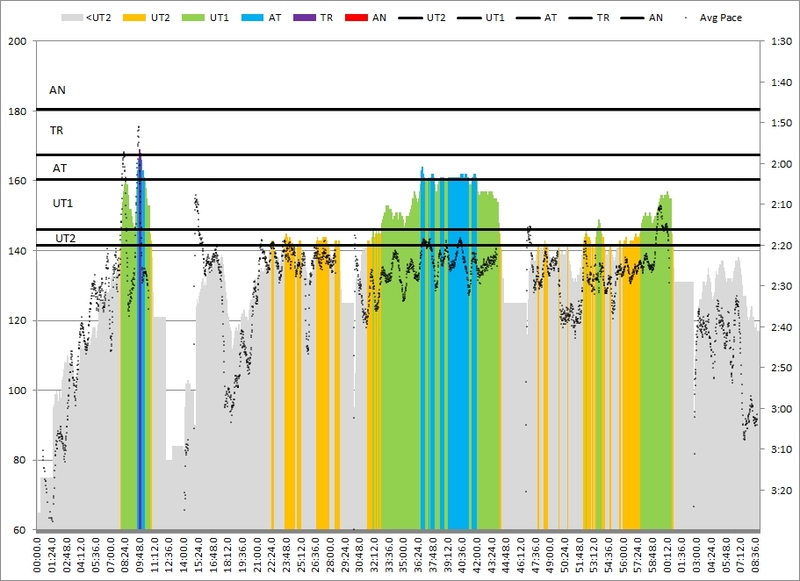 Training today consists of a bike ride to work and a bike ride home, 2×45 minutes in total of active recovery. 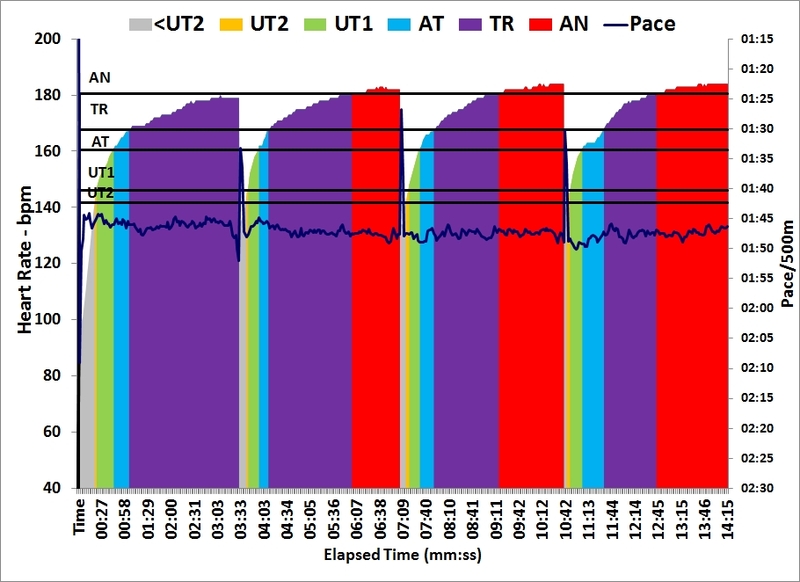 Interestingly, even though I classified yesterday’s session as “needs to be done at higher intensity”, I had unusually “empty” legs this morning. We slept in late and I spent the morning fiddling with my annual training plan, and in the afternoon we had the Christmas party on the rowing club. So I had little time to train. 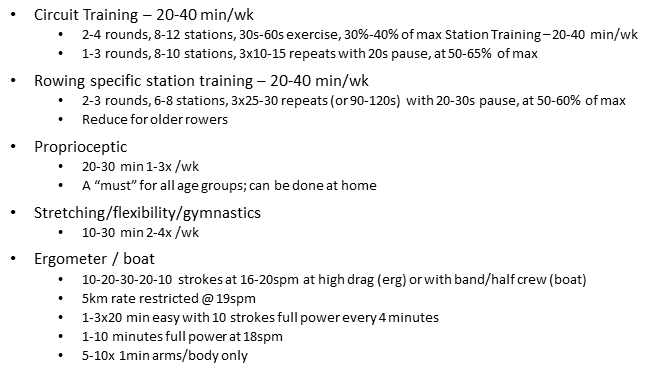 Wanted to do an endurance session and decided to try one of the sessions from the Olbrecht book. It’s a swimming endurance session described as 6x500m at 20 seconds rest. The description also seems to indicate to swim it as 50m fast / 50m slow but I am not 100% sure about that. Anyway, I decided that a good erg equivalent would be a 6x1500m at 20 seconds rest, and to do every fourth 500m at slightly faster (“6k”) pace. I should have done this at a slightly faster pace. It felt like a black hole training. Pleasantly exhausting but not too hard. Still it’s a good session to add to the mix. Should be more like a threshold session but I should do it slightly faster. If I do it another time, I should do the slow bits at today’s average and the fast bits at 6k pace. Perhaps I should also do alternating 150m fast and slow. In the past years I have rowed according to an intuitive year plan which I didn’t write down. 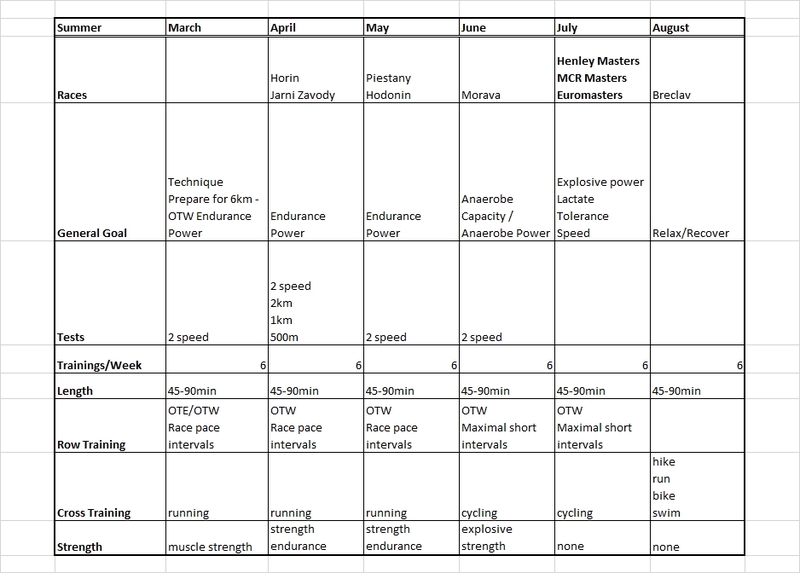 I would build up endurance during the fall (like this year), use the Christmas vacation for some SB/PB attempts, then work towards the shorter erg tests (5km, 2km, 1km, 500m) during the spring, then prepare for the head race, and subsequently dive into sprint season. This year will be no different in terms of macro cycles, but I want to try to plan the meso cycles a bit more explicitly. The Olbrecht book has some templates, with the instruction to copy and enlarge them for use. Of course I will use excel instead. 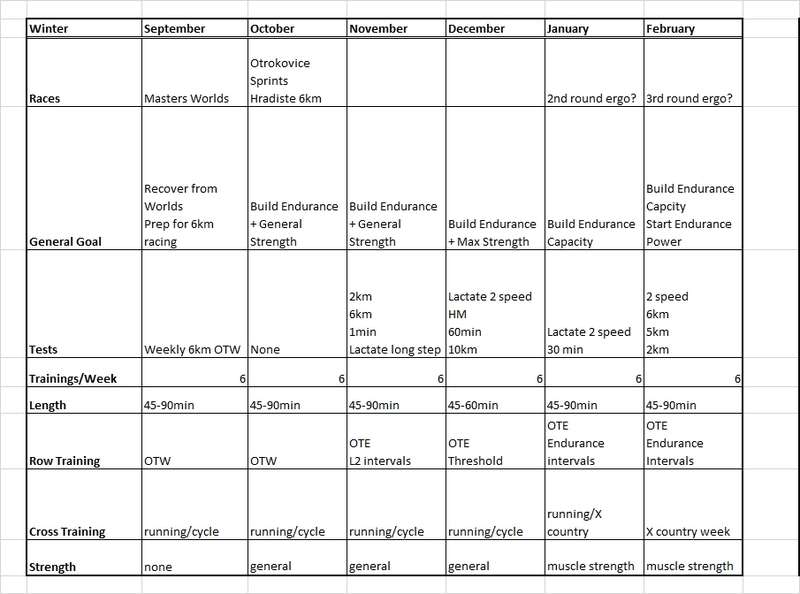 So this morning I looked at the race calendar and tried to build up a logical year plan. I will skip Masters Worlds in Copenhagen. Instead, my important sprint races will be the Czech Open Masters and Euromasters in Munich. The other important race will be the 6km in Horin in the Men’s LW category. 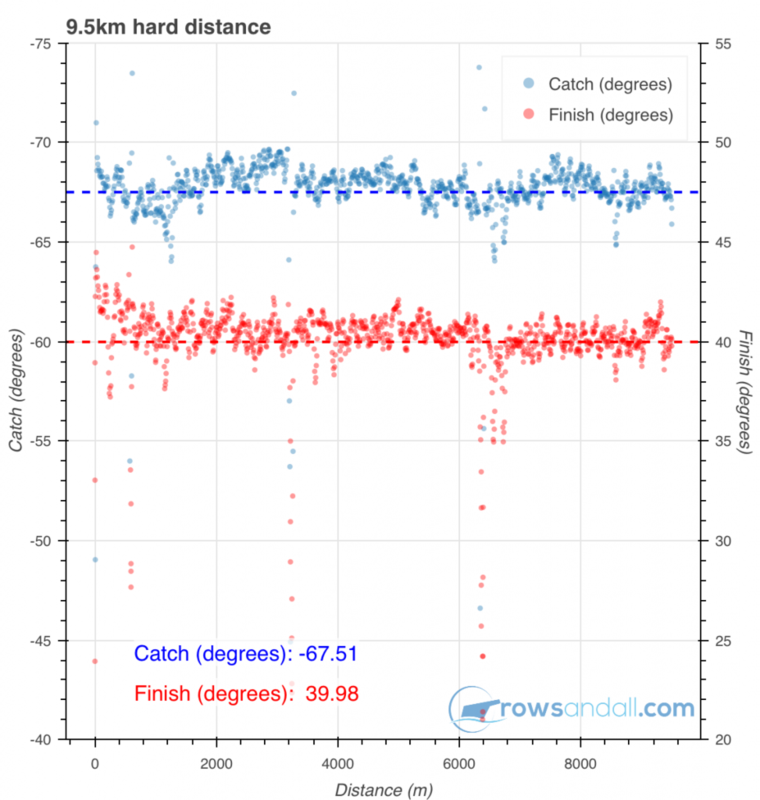 This gives me a distance (“head race”) peak in April and a sprint race peak in July. If I manage to get into Henley Masters, I will row it as well. The Slovak Championship and the regional races will be training races, with little taper. This was easy to create. The hard part will be to plan the first few meso cycles. Looking forward to the challenge. Romana and the girls want to row erg races on the 9th of January and the 30th of January, so I tentatively put them into the schedule. I have to make a confession. When I ignore my Junior/Young Senior career, I have never rowed an erg race. As a junior I dreaded the compulsory erg testing that we had to do with rowing association officials noting your time. Looking at the results from the first round of the Czech Indoor Rowing cup, I guess I will be about 30 seconds behind the winner. But if I accompany Romana and the girls to the venue, I might just as well row the race, right? 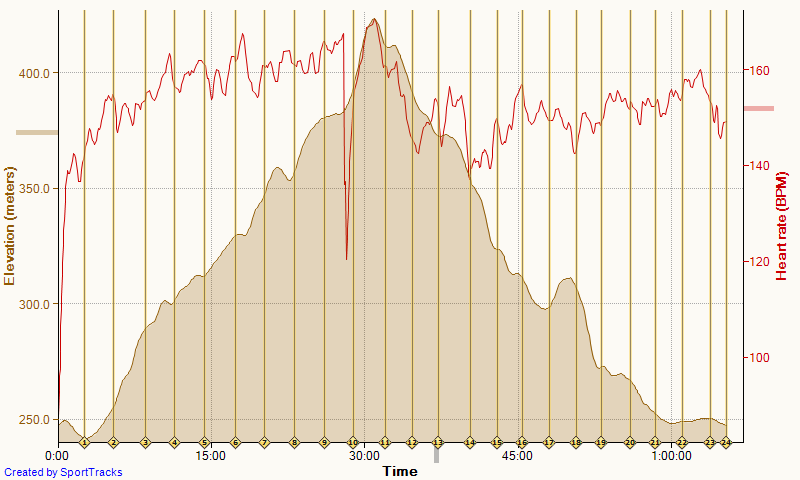 The training plan had rate ladders OTW, but I felt more like a recovery run, after yesterday’s hard 6km. Also, the weather was very nice. It has been dry and sunny for quite a while, so I fancied a trail run. I even took time to read the info panel about the water quality. I just remember that the water temperature is +7C year round and that the water fulfills all norms for drinking water, and has some good minerals. It’s a great pit stop. On the top picture, I have put a green oval around a piece with suspicious pace. Looking carefully, I the average pace is correct. Apparently in that valley I had bad satellite coverage or something, because this is a flat part of the run and I really ran a constant pace. Good stretching after the run. In the afternoon I spent two hours at the wellness. Sauna’s, hot tubs, steam … and relaxing in the autumn sun. 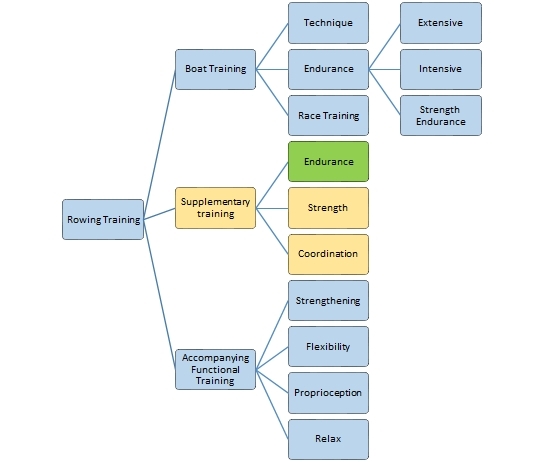 This schedule amounts to 25% compensation, 49% extensive endurance, 13% intensive endurance and 13% strength. Monday: Alarm clock at 3:30 to catch the 7AM Vienna – Brussels flight. Meetings all day. Catch the 9PM Brussels – Toulouse flight. Arrive in Pullman hotel around midnight. Saturday: Drive trailer to Otrokovice. Sprint Races (2x450m). Drive home with trailer. At least that’s the plan for now. Let’s see how it works out. Well, that’s interesting. I am thinking of I would work that into my training program. During winter, I frequently run. I have lovely hilly forests starting just behind my home, so trail running is always a pleasure. Also, running is my go-to cross-training when on travel. Running gear doesn’t add much weight to my travel luggage. With my recently purchased second-hand mountain bike, the mountain biking is nice as well, although I must say I am not really a downhill MTB hero. Too scared to fall. I have also been experimenting with replacing some of my car or public transport commutes with the bike. It is great, although it does come with breathing car exhaust, microparticles, etc. At least under the new city council it has become slightly safer (a few more bike lanes). With showers and a locker at work, the infrastructure seems in place. Just wondering how this plan is going to hold when ice and snow make it difficult. I love cross country skiing and plan to do this in weekends in the winter. It’s perfect cross-training. I also plan to have at least one week of vacation/training camp in the mountains. All in all I think I can get in 2.5 hours of cross training per week. For strength training, Das Buch has the following remarks. Introduce variation. Not always the same exercise per muscle group. Romana does a circuit training on Friday afternoons with her training group of 15-18 year old girls. I could try to join them. Perhaps the weights will be a bit on the light side, but I could do more repeats. More than half of the exercises on Romana’s circuit training use own body weight anyway. For the “station training” I could try to visit a fitness club in the neighborhood. Alternatively, I could buy the basic stuff and do circuit and weights at home. Finally, Das Buch describes how to improve coordination. The book recommends to work on this 2-3 times per week, 4-10 exercises, and suggests playing games, dancing, other sports and “proprioceptic training”. They also comment that OTW rowing falls under coordination exercise, but needs complementary training. Well, I have a fitness ball at home, so I could do situps and pushups using the fitness ball. 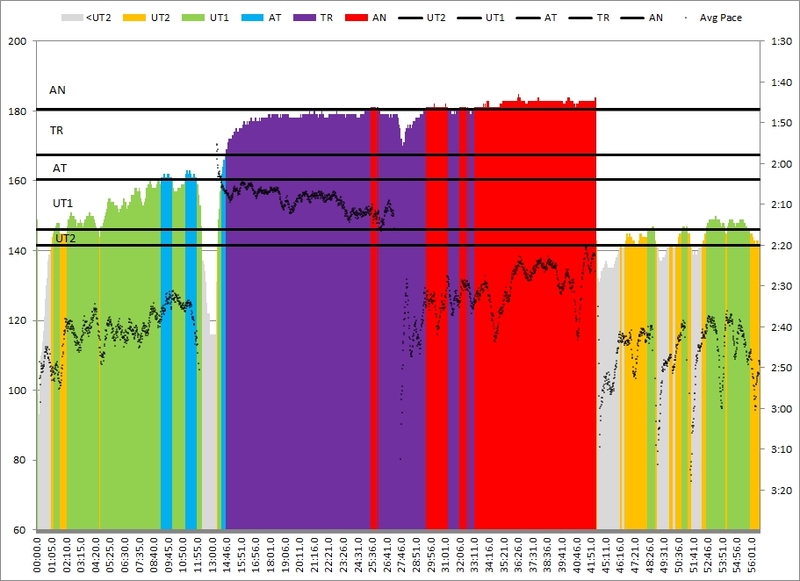 Is that enough coordination training? I don’t know. I had steady state on the training program. Next weekend, I will row a sprint race in the double with my daughter Lenka. So we took out our double and did 12km of steady state, including technique drills and start drills. 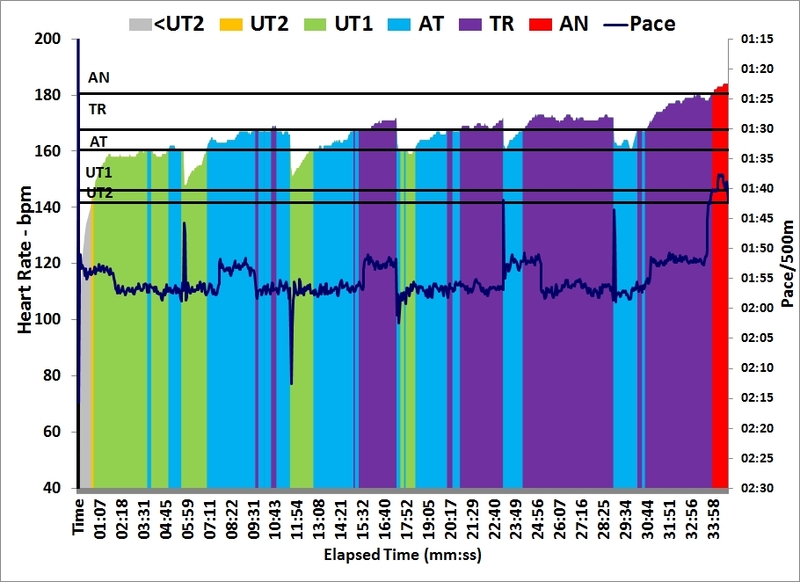 Nice steady state training. 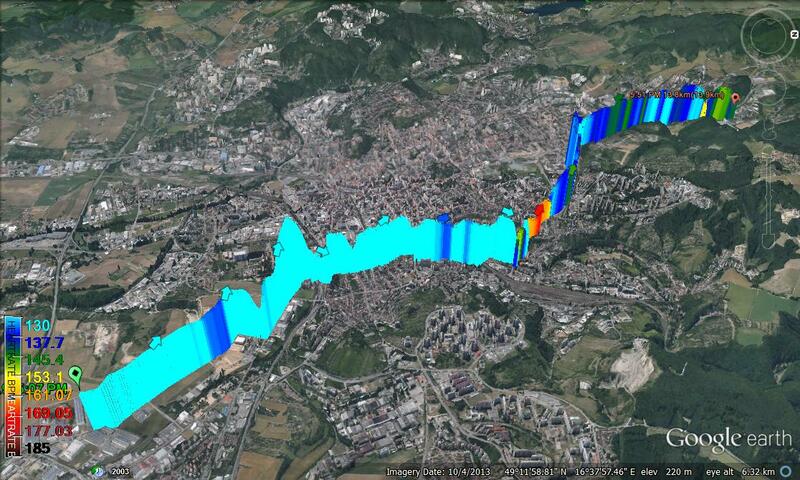 Tomorrow: A 6km head race simulation in the single. After the training I helped bring a launch from our Lake Center to the River Club House, using my trailer. 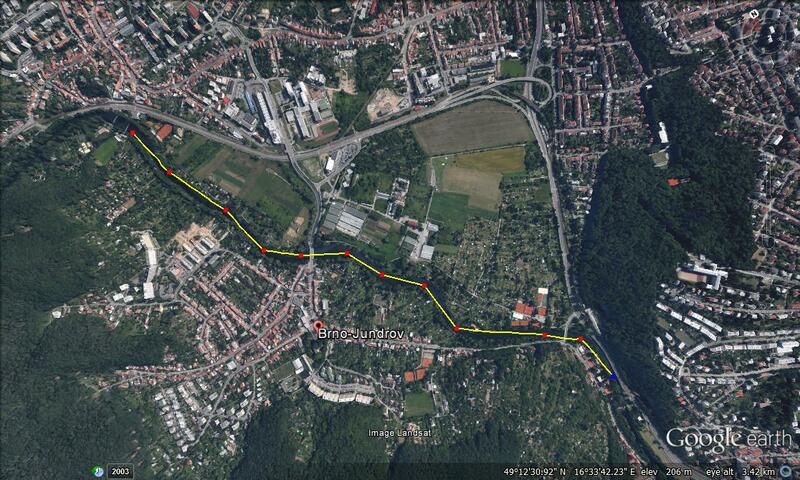 Coming Wednesday, there will be the first Brno Academic Rowing Races. Two eights will row a race on the river Svratka in Jundrov. One eight filled with students from the Technical University, the other one with students from the Masaryk University. The 2.5km race course is quite narrow and has many turns. The idea is to make it a tradition and stimulate student rowing in Brno. I am slightly skeptical, but if it succeeds it will be great.